Apple New iPad review | What Hi-Fi? Apple launches: hilarious, aren’t they? The whole world (it can seem) works itself into a tizzy about when they’re going to be and what’s going to be unveiled. Theories and leaks pour in from ‘analysts’ and ‘industry insiders’, none of whom actually know anything because the folks over in Cupertino remain as tight-lipped as a camel in a sandstorm, while frantic consumers weigh up whether they should put their current-gen iPod, iPhone or iPad on ebay before it becomes last-gen.
And then what happens? We get an hour-and-a-half presentation and are left with an iPad that not only isn’t called iPad 3, but is actually fatter and heavier than the iPad 2. Who are these guys kidding? Well, actually, no-one. The new iPad might look nigh-on identical to the iPad 2, but it was always going to – after all, a tablet is just a rectangle with a screen really, and here it’s that most vital of components that’s been most updated and improved. That’s right, the new iPad has a Retina Display. Jumping from the iPad 2’s 1024x768 screen to one with a stupendously large 2048x1536 resolution makes a huge difference to just about everything you do on your tablet. From web browsing to reading to photo editing to the all-important movie watching, this display makes it crisper, more vibrant and downright better. Of course, a display of that magnitude would be wasted on 720p content, which is why Apple has taken the very wise decision to upgrade the iTunes Store’s HD video content to 1080p. The only thing is, while the US has already been treated to a handful of 1080p movies, the UK store is still waiting. Getting Full HD content onboard right now isn’t impossible, though, so armed with some stored 1080p movies and a handful of trailers and clips from the Apple website, we’re able to find out just how good the new iPad is with video. And boy, is it good. Play the same downloaded clip of Seeking Justice on both it and the iPad 2, and the level of difference between the two is stark. Most obvious is the shift in colour balance: the iPad 2, previously considered to be very neutral by tablet standards, is surprisingly flushed next to its successor. There’s simply an extra bit of colour and saturation that isn’t quite in touch with the film’s subdued, grey-brown balance, which the new iPad absolutely nails. Look beyond the colours and it’s also clear that the extra resolution makes a big difference to HD movies. Edges are that bit sharper, fine details are clearer and better defined (but never exaggerated), and the authentic picture grain is more, well, authentic. In terms of contrast there’s not a huge amount in it. The new iPad’s whites are clearly whiter, but that’s more down to the purity of its colours than extra outright punch, and if anything the iPad 2 seems to create the deeper blacks – at least at first sight. Look closer, though, and what you realise is that the new iPad goes just as deep, but that it has more subtlety and gradation on the way to its blackest black, which gives you a more realistic overall tone and greater insight into dark scenes and patterns. One of the things that makes the iPad really great, though (and here we’re talking about all generations), is that it allows you to get your video content from a variety of sources, so what of the Netflix and iPlayer performance? Surely the extra upscaling that the new model has to do must hinder it when it comes to streaming lower quality files? Play the latest episode of the Hairy Bikers Bakeation (see what they did there?) from BBC iPlayer and it seems that’s not the case. Not only does the aforementioned difference in colour palette appear again, but the extra sharpness of the new iPad is striking. Even standard-definition videos played though the Netflix app look marginally better on the new screen. Let’s think about that for a second: the new iPad is upscaling the 576p stream not to 720p, not to 1080p, but right up to 2048x1536, and while it’s certainly not going to fool you into thinking you’re watching native HD content, it does a much better job with standard-def than it really has any right to. While we’re on the subject of scaling it’s worth pointing out that the new iPad’s content actually needs to be downscaled to fit onto a Full HD TV, which is pretty incredible when you think about it. That’s also why you need a new adapter for the 30-pin connector in order to do it, although you can also use AirPlay to an Apple TV, the new version of which has launched simultaneously with the new iPad and has handily been upgraded to 1080p. The only fly in the new iPad’s movie-playing ointment is down to its screen ratio. Newer tablets such as the Asus Transformer Prime and Samsung Galaxy Tab have 16:9 (or close) screens, but Apple has opted to stick with the 4:3 ratio, which leaves chunky black bars to the top and bottom of the screen when you watch a widescreen movie (unless you zoom in, which crops to the left and right). Frankly, we’ll take higher quality over bigger pictures in most situations, and the new iPad delivers video of far higher quality than its rivals. Of course, the iPad is and always has been about way more than watching movies. For a start, gaming has become a core feature of, and use for, a tablet, and thanks to the combination of that screen and a new four-core graphics processor, the new iPad has seriously increased its credentials in the gaming arena. The inevitable tsunami of Retina Display-optimised games isn’t even a trickle yet, but we have seen flagship titles Infinity Blade: Dungeons and Sky Gamblers: Air Supremacy in action, and the lighting effects, physics and slickness of both are truly console-quality at the ultra-hi-res 2048x1536. And don’t forget that there are already thousands of games available on the App Store, and these can be almost as good at showing off the snazzy new display. Galaxy on Fire 2 HD, for example, with its 3D models, dynamic lighting and real-time physics benefits significantly from the extra grunt of the new iPad. Where the iPad 2 drops frames when the action gets frantic, the new iPad remains as smooth as melting butter and digs up more of the fine detail. How good is it with music? Where music is concerned there’s very little between the new iPad and its predecessor. There’s perhaps a smidge of greater separation to instruments and vocals from the new model, but it really is close enough to make almost no difference. Of course, the iPad 2 was clearly at the forefront in this department, anyway, which means the new model remains the top tablet for music enjoyment, with greater dynamic range, detail and rhythm to our Apple Lossless rip of Radiohead’s There There. True, it’s a shame that Apple doesn’t support FLAC, but WAV is on-board for those who like their uncompressed formats. While perhaps not core for us at What Hi-Fi? Sound and Vision, it is worth pointing out that the iPad is now being pushed as a tool for content creation almost as much as content consumption, and to that end Apple is heavily pushing its iLife suite of apps, which includes iPhoto, iMovies and GarageBand. Using all three is an absolute joy on the responsive touchscreen and with the intuitive menus, and while the camera still doesn’t capture snaps or films of astounding quality (although at 5MP and with 1080p support it’s far better than before), you can get your dedicated camera and camcorder’s content onto the new iPad using cloud storage solutions such as Dropbox or by purchasing the optional SD card adapter. We’d really recommend it, too: not only is the screen of such a high quality as to make serious movie and photo editing a distinct possibility, it’s easy enough to allow even beginners to achieve impressive results. So, while we still wouldn’t go as far as to suggest that anyone strictly needs an iPad, those that buy one will find a million things to do with it. That means it’s going to get a heck of a lot of use, so it’s a good thing that the battery lasts as long as the iPad 2’s, despite all of the extra processing and pixels. The only slight disappointment is that Apple has made this a possibility in an uncharacteristically simple way: it’s whacked a massive battery in it, which not only contributes to that extra weight and thickness, but also means it takes much, much longer to charge. For many people this won’t be a significant issue, but it’s worth bearing in mind. Our only other slight concern is over storage. Apps, movies, games and magazines that are optimized for the new, higher resolution will take up significantly more space than previous versions. Magazines with interactive elements could well hit 1GB, while iTunes movie downloads in HD can be anything between 3GB and 5GB, so it’s easy to see how both the 16GB and 32GB versions of the new iPad could quickly reach capacity. The 64GB version should last longer, of course, but we can’t help but feel that a 96GB or even 128GB version should be now be offered, even though it would undoubtedly command a huge price-tag. The world was hoping for 4G from the iPad, and by jove, we got it. Well, nearly. The 64GB 4G version we tested has the tech inside, but it isn't (and never will be) supported in the UK as it's only suitable for the AT&T network in the USA. Given that the UK has no 4G LTE networks yet, it seems churlish to complain. The UK’s consolation prize is HSPA+ and the forthcoming DC-HSPA, with respective bandwidths of 21Mbps and 42Mbps – three and six times what the iPad 2 can muster (7.2Mbps). Our speed tests using a SIM from 3 achieved more like 6Mbps, which may not sound like much, but it’s easily the equal of any dongle or smartphone we’ve tried. Not 4G, but not bad. So, with our biggest complaint being that we’d really like more space to store more things on it, it’s clear that we’re rather enamoured with Apple’s latest tech-rectangle. It’s as easy to use as ever, it still has the biggest music, movie and app stores of anyone, and it’s now got masses of power and a pixel-count to make almost all flatscreens blush. 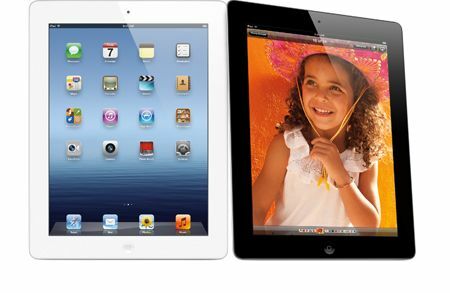 As a result, those about to dip their toe into the murky world of tablets for the first time have a very easy decision to make, and while it may not be quite as black-and-white for those iPad 2 owners considering an upgrade, that screen makes all the difference in the right circumstances.